“Britain is going to war with Iraq”- I still remember sitting in a school assembly when those words were uttered. Even after a decade, both the United States and Britain are still lingering in the Middle East. Have they really ‘emancipated’ the people from the reins of a dictator, or did the West just expel themselves of a threat to their insecurity? Was it really ever about weapons of mass destruction, extracting oil or promoting democracy? The war symbolises how the structure of global politics dominates in favour of a Eurocentric approach, a crusade of neo-liberal and realist ideologies and consequently the prejudiced undertones of the ‘West versus Other’ mentality. Gusterson notes that this observation is a form of “Nuclear Orientalism” or outright “Nuclear Racism” in which those with shared Western cultural identities and ideologies group together, creating oppositions such as “civilised” vs. “barbarian”; “West” vs. “Other”; and “modern” vs. “backwards”. As soon as we see these terms, because of mainstream discourse and media, we immediately associate this positioning ‘as a matter of fact’ to non-Western countries. What ‘nuclear defence weapons’ are to the West, ‘weapons of mass destruction’ are to the East. But what is missing from the mainstream, is the point that the language used is discriminatory from the outset. The West has determined what states are considered to be ‘sovereign’ or ‘real’ and which are considered ‘quasi-states’ i.e. ‘not-formally-seen as sovereign’ states. Even Germany, with one of the most advanced economies in Europe has long-been considered only ‘semi-sovereign’, principally because of the Second World War. So it’s hardly a surprise that a Middle Eastern country such as Iraq would be seen as a ‘rogue-state’ alongside many of the Arab nations, “too immature” to play with nuclear weapons. Subsequently when Stephen Hadley, the national security adviser under President George W. Bush from 2005 to 2009, helped to sell the war to the public, even Hadley said he was wrong in citing Saddam Hussein’s alleged stock of weapons of mass destruction as a reason for the invasion. He stands by the judgment, however, that Saddam was a threat to the US and the region. So this isn’t about the fact that Iraq had nuclear weapons as such- it’s about ‘the wrong people’ having nuclear weapons. In Western discourse, the passionate or instinctual has been identified with women and implicitly contrasted with male human rationality. Third World nations are also portrayed as children, and the US as a parental figure ensuring “good behaviour”. In a 1987 New York Times editorial on Pakistan’s nuclear programme, it speaks of the US “scoldings” of Pakistan and that “US demands for good Pakistani behavior from now on“. As Hadley wrote in the Wall Street Journal in 2010: “[The Iraqi people] endured great brutality under Saddam, suffered enormous hardship after the invasion, joined forces with us to liberate themselves from al Qaeda terrorism […] But even Iraqis admit that they could not have succeeded without the United States.” This only goes to highlight the Western attitude, in which they see themselves as “saving” populations – in the same vein as European NGOs and formerly Christian missionaries, spreading the word of Western ideology. 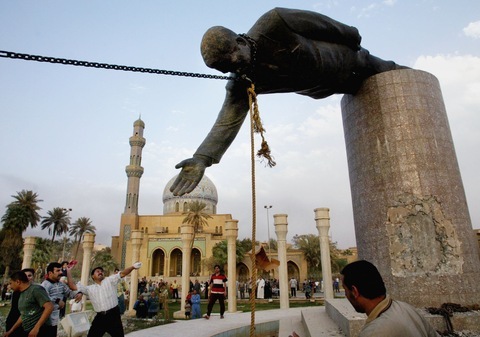 We will keep seeing iconic images, such as the toppling of the statue of Saddam Hussein, the victory signs made by Iraqi civilians and the “success” of the Iraq war. 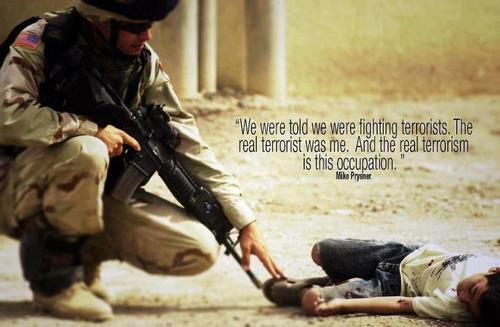 But are Iraqis really living in ‘ebony and ivory’ with US and UK troops? The National Public Radio quotes that so far, about 4,400 US troops, of which 136 have been killed in action; while the BBC writes that 179 British service personnel, and more than 100,000 Iraqi civilians, have been killed. The Iraqi people are portrayed to be “ungrateful” to the West for ‘liberating’ them, despite the catastrophic number of Iraqi deaths. In the language of realist defence intellectuals, better still the current CIA director John Brennan – civilian deaths are merely seen as “collateral damage”, whilst the security of a state by its armed forces against the Other is by far the most important factor of international politics. At his confirmation hearing to become CIA director, Brennan was questioned on why drone strikes were being used. He insisted that targeted killing programs were used only as “a last resort to save lives when is there is no other alternative.” What this only goes to show is that Western lives are worth “saving” at the expense of non-Westerns – a slightly worrying notion that the leading political discourse, in which global politics uses as a foundation and claims to be ‘rational’ and objective, is evidently prejudiced. Edward Said, the literary virtuoso behind “Orientalism” identified the fear of a Muslim holy war as one of the cornerstones of orientalist ideology, which was labelled as the “Islamic bomb”. Unsurprisingly, Iran is next on the “kill list”. So why does the West invade a country in the name of “saving” it, and in the same breath label the peoples “backwards” and a “threat?” It surely isn’t in the Iraqi interest, but rather safeguarding the neo-liberal identity. Iraq continues to experience violence on a daily basis even with Western ‘humanitarian intervention’ and the death of Saddam Hussein. So it’s barely a measure to go by. By framing political dynamics in non-Western contexts in comparison to models of European state formation only seems to continue dominance of Western powers within the state system, and what we are left with is a smokescreen of a valiant knight in shining armour protecting the damsel in distress. Posted by suswatibasu on March 17, 2013 in Global Issues and tagged Anniversary, Iraq War, Nuclear weapons, Orientalism, Racism.